Two daily editors who left their roles in a management shake-up were told they would be demoted if they stayed, an MP has claimed. Christopher Stephens says Graeme Smith and Graham Shields, who ran Glasgow-based dailies The Herald and the Evening Times respectively, were told they would be “stood down to the role of deputy editor with substantial pay cuts” if they stayed. 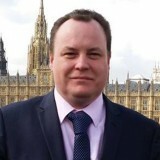 Mr Stephens, a Scottish National Party member who represents Glasgow South West in Parliament, made the claims in an Early Day Motion tabled at Westminster. In the EDM, he also says five senior members of staff at the Newsquest-owned Herald & Times Group were offered redundancy packages and that a deputy sports editor has left with an exit package. Graeme, who became Herald editor last year, had 17 years’ service at the paper, while Graham, who took the chair at the Evening Times in April 2016, had completed 19 years with the company. Donald Martin, who returned to Newsquest last November as editor-in-chief of the two titles, has now taken over responsibility for editing both titles. The EDM submitted by Mr Stephens, pictured, states: “This House is alarmed by recent actions by Newsquest, owner of The Herald and Evening Times newspapers; is concerned by the approach to five senior members of staff offering redundancy packages, notes that in the last few weeks, the editors of The Herald and Evening Times were told they would be stood down to the role of deputy editor with substantial pay cuts. “[It] further notes that those editors were told they would operate in the same way as previously but under one Editor for both titles, notes that both editors refused those offers and faced dismissal before intervention by the National Union of Journalists so that exit packages were negotiated. The motion won the support of 17 MPs. A Newsquest spokesman said: “We are disappointed with the Early Day Motion by MPs, particularly as the matter at the Herald & Times was dealt with amicably without the involvement of the NUJ, as incorrectly reported. “Nor were they dismissed – in fact they were offered alternative roles in the senior editorial team.